A binary system 14,800 light-years from Earth known as X9 likely contains a white dwarf circling a stellar mass black hole once every 28 minutes, a new study suggests. A white dwarf star nearly 15,000 light-years from Earth apparently whips around its companion black hole once every 28 minutes, a new study suggests. That means the two objects are likely separated by just 2.5 Earth-moon distances — the tightest such orbit ever observed around a black hole, study team members said. 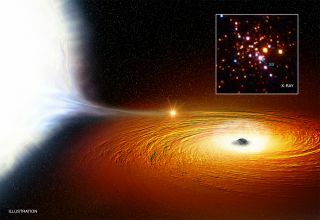 But the black hole could still end up destroying the white dwarf, team members said. "Eventually, so much matter may be pulled away from the white dwarf that it ends up only having the mass of a planet," co-author Craig Heinke, an associate professor of physics at the University of Alberta, said in the same statement. "If it keeps losing mass, the white dwarf may completely evaporate." White dwarfs are the corpses of sun-like stars that have run out of fuel. These objects tend to pack roughly the mass of the sun into a body only slightly larger than Earth, making them about 200,000 times denser than our planet. The white-dwarf-black-hole binary that's the focus of the new study is called X9. It lies 14,800 light-years from Earth, in the globular cluster 47 Tucanae, and features a stellar mass black hole. Such objects are lightweights as black holes go, tending to harbor five to 10 times more mass than the sun, astronomers have said. For the new study, the research team observed X9 with two space telescopes (NASA's Chandra X-ray Observatory and the agency's Nuclear Spectroscopic Telescope Array, or NuSTAR) and one ground-based instrument (the Australia Telescope Compact Array). The data revealed that X9 brightens in X-ray light once every 28 minutes, which the team interpreted as the white dwarf's orbital period. And they think the system does indeed contain a white dwarf, because Chandra spotted a lot of oxygen in the system, a characteristic feature of these stellar corpses. The binary might have been born when a black hole encountered a red giant — a bloated, dying star on its way to becoming a white dwarf, the researchers said. Over time, the emission of gravitational waves has brought the two objects into their tight orbital dance. Such gravitational waves are too low-frequency to be detected by the Laser Interferometer Gravitational-Wave Observatory (LIGO), which recently spotted waves from several different black-hole mergers, study team members said. The team favors the white-dwarf-black-hole scenario for the X9 binary, but it's not the only explanation for the system. It's also possible that the white dwarf orbits not a black hole but a neutron star, a stellar corpse even denser than a white dwarf. In such pairings, neutron stars rotate faster and faster as they pull material from their companions, sometimes spinning on their axes thousands of times per second. When this happens, the neutron stars become known as "transitional millisecond pulsars." The light emitted by transitional millisecond pulsars is extremely variable in X-ray and radio wavelengths — characteristics not seen in the X9 system, study team members said. But they can't rule out this hypothesis yet. "We're going to watch this binary closely in the future, since we know little about how such an extreme system should behave", said co-author Vlad Tudor, of Curtin University and the International Centre for Radio Astronomy Research in Perth, Australia. "We're also going to keep studying globular clusters in our galaxy to see if more evidence for very tight black-hole binaries can be found." The new study has been accepted for publication by the journal Monthly Notices of the Royal Astronomical Society. You can read it for free on the online preprint site arXiv.org.